Professor Robert Bertini of Portland State University will be giving the Warren Lecture on Friday Nov. 8 at 3:30 pm at the Civil Engineering Building (500 Pillsbury Drive SE) in CE210. This is open to the public. ABSTRACT: Over the past 20 years the transportation engineering field has witnessed a data revolution—some might say that we have transitioned from a data “desert” to a data “ocean.” Intelligent transportation systems data can be archived and managed carefully to provide a platform for analysis, visualization and modeling. With increasing attention being paid to performance and financial issues related to the operation of public transportation systems, it is necessary to develop tools for improving the efficiency and effectiveness of service offerings. With the availability of high resolution archived stop-level bus performance data, it is shown that a bus trip time model and a bus stop spacing model can be generated and tested with the aim of minimizing the operating cost while maintaining a high degree of transit accessibility. In this research, two cost components are considered in the stop spacing model including passenger access cost and in-vehicle passenger stopping cost, and are combined and optimized to minimize total cost. 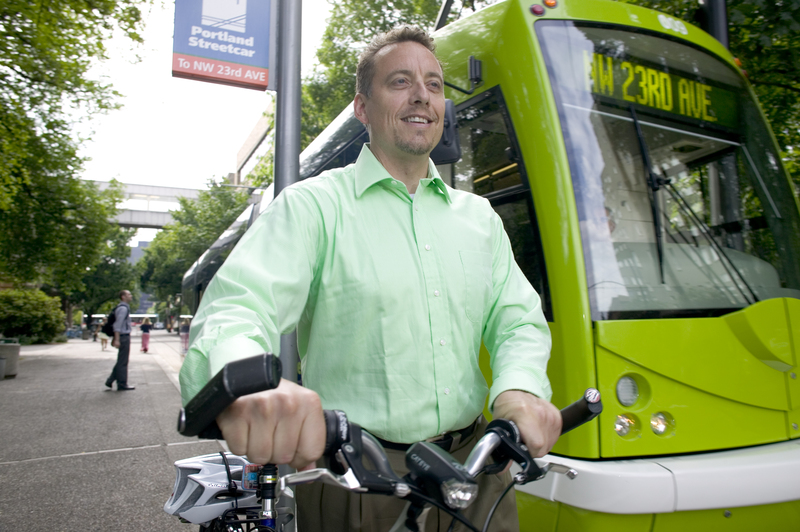 A case study is conducted using one bus route in Portland, Oregon, using one year’s stop-level archived Bus Dispatch System (BDS) data provided by TriMet, the regional transit provider for the Portland metropolitan area. Based on previous research considering inbound trips over the entire day, the theoretical optimized bus stop spacing was about 1,200 feet, as compared to the current value of 950 feet. Trade-offs will be discussed as well as an estimate of transit operating cost savings based on the optimized spacing. Given the availability of high resolution archived data, the paper illustrates that this modeling tool can be applied in a routine way across multiple routes as part of an ongoing service planning and performance measurement process. There will be a webcast. We talk about introducing information technologies into surface transportation. That is what “Intelligent Transportation Systems” are all about. But the most important information technology is price. Price is not itself a good, but rather a technology that gives you information about the value at which people will exchange one good or service for another. The price tells you that you will have to give so many dollars in exchange for a widget, or the right to ride the bus, or to travel across the bridge. The first problem in surface transportation in advanced economies (where the network and vehicles exist and are widespread) is who gets to use which piece of infrastructure at what time (the problem of allocation). The second is the problem of paying for the maintenance of existing facilities (the problem of funding). The structural feature at the core of these problems is the lack of an apparent price which is sensitive to time of day, location, and costs. When travelers drive an untolled road in the US, they still have a small price to pay: their time and the monetary costs of operating an automobile, including gas taxes. But those prices contain very little information, and do not represent the costs they impose on the system (their marginal costs). The cost of fuel does not reflect the cost of traveling during the peak (except to the extent that fuel consumption is higher in stop-and-go traffic), or the cost of traveling on costly or critical facilities. The price travelers face is not real-time or real-space, but rather an abstracted expectation of average costs (assuming drivers pay their full costs, which they don’t off the freeway, or even on the freeway when you account for externalities, in the US). We should move prices into the modern era, where they vary in time and place, to reflect the real costs of travel, just as other goods have prices that vary with demand. When demand is up for gasoline, or houses, the prices rise. When supply rises, prices fall. When demand falls or supply rises, the price falls with it. The price represents the matching of consumer’s willingness to pay (to the extent the supplier has monopoly powers) with supplier’s willingness to accept (assuming competition in the marketplace). This can simultaneously solve both the problem of allocation and reduce if not eliminating congestion, and the problem of funding.